There is a good reason why many of the worlds most influential companies are employing murals in their interiors. Never before has ambience been so important, with the increasing trend for posting photographs of everything and anything, suddenly how where we work/eat/drink/live looks, is of the utmost concern. 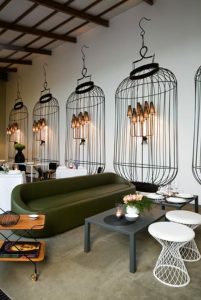 There are even lists of the most Instagrammable restaurants in some cities and most include some kind of wall art; simple white coloured walls are no longer what staff and customers expect. So is it is not surprising that wall murals have been growing in popularity; a picture as they say, paints a thousand words. The simple fact is that large scale wall art attracts attention and therefore, attracts employees and customers. your personality, your business’ decor and of course, your budget. Whether we are talking printed wall murals that are applied like a wallpaper or decals, or a hand painted piece of art, the effects on your staff and customers will be very similar, so it is worth exploring how they differ and which is best for what situation. Cost. If the image to be printed is already purchased, the difference in cost between printed wall murals and painted is negligible, so as to not be a differentiator. Surface. 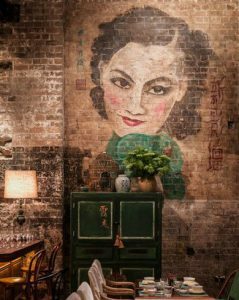 Printed wall murals need to be applied to a flat well prepared surface, painted murals can be applied to bare brick, breeze block, wood and other uneven surfaces. Painted murals can be made completely waterproof, so are better suited to areas such as kitchens and bathrooms. Longevity. This depends on the environment, many restaurants shy away from certain printed materials that contain solvents, but in short, in most commercial environments, there is little difference in how the murals will wear. It is worth bearing in mind that if a printed mural is damaged, it will have to be replaced, whilst a painted mural can be repaired. Many of the public areas murals that Charlotte Designs produces are treated with a protector which makes them fairly indestructible. Flexibility. This is one area where the painted mural has a huge advantage. The main issue with printed murals, once they are printed, that is it. If it doesn’t quite fit, or the client changes their mind, there is no other option than starting again. However, painted murals can be changed and added to right up to the last minute. Murals have been reversed at the last minute, new elements added or removed and even colour schemes changed. Timescales. The process of producing printed and painted murals is quite different. The design process is quite similar, however, mural printing will depend on how busy the printer is. Large scale painting of a mural will certainly take longer that installing a printed mural once it is printed. So all in all, printed murals may have a quicker turn around than painted ones. Great use of printed wall art to create a repeated image. Overall look and feel. Whilst there are always practicalities to take into consideration when selecting the right product for the project, the overriding factor will be, how does it look? Both photographs and painted art have their unique qualities, the printed wall mural can be reproduced exactly if continuity is required. With painted murals, you are getting a genuine, original piece of art. No two are the same, and you simply can’t beat hand painted for that authentic feeling. Whether you want photo realism or a piece of original art that your customers and employees and walk right into, wall art is the modern way of creating an exceptional, memorable interior that will make a lasting impression on all who see it.